Do you know someone who always asks you for something whenever they see you? It could be something big like helping them move, or it could be something small like a quarter for a vending machine. It doesn’t matter the size–it is always something. Even though this person is very likeable, most likely a friend, over time the persistent asking of favors becomes taxing. To make matters worse, the only time they are able to help you is if you provide assistance to them first. After awhile it becomes hard to be around this person. If you are not careful, your marketing can become just like this person. Marketing, after all, is nothing more than an “ask.” Every time you have your audience’s attention, you ask them to complete a desired action. This can be signing up for an email newsletter, scheduling an appointment, or making a purchase. The relationship with your audience becomes purely transactional, meaning they must give you something of value to have your attention. You are seen as nothing more than a salesperson and your desired audience will tune you and your message out. Instead, your goal should be to be seen as a knowledgeable resource to which they can turn when they are in need. Your potential and current customers are more likely to respond in a positive way if you present yourself as a resource instead of a salesperson. How your current and potential customers view your business greatly impacts how they interact with you. If you are seen as only a salesperson you will be mostly, if not entirely, ignored. 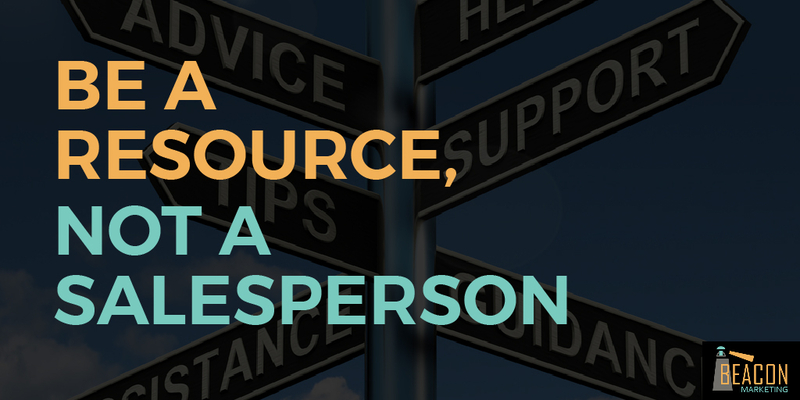 Conversely, if you are seen as a resource, your audience will not only look for you when they have a question, but they will recommend you to their friends and family. Learn more about your industry – as you provide information about your business and industry, you learn about current trends. Improve your services/products – learning more about your industry gives you insights into how you might be able to improve your business. Become a leader – not many businesses act as a resource. Becoming one of the few makes you stand out. Gain trust from your customers – the more you engage with your audience, the more they begin to trust you. Connect with your audience – Add all these things together and you will have a much greater chance of creating a longer lasting connection with your audience. Your current and potential customers are looking for resources to make their lives easier. Be that resource and you can greatly increase the chances of gaining their loyalty. These are just some of the ways you can be a resource to your current and potential customers. Choose a way that fits into your marketing and business goals. Whatever path you decide to follow, just make sure it’s about their needs, which will help you provide value to your audience. If you would like to find out how you can be more of a resource to your audience, schedule a FREE 60 minute consultation today!